For the commercial process, see canning. A 1914 advertisement for a combination steam canner and roaster. The described method will not protect against botulism. 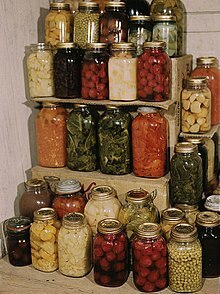 Home canning or bottling, also known colloquially as putting up or processing, is the process of preserving foods, in particular, fruits, vegetables, and meats, by packing them into glass jars and then heating the jars to create a vacuum seal and kill the organisms that would create spoilage. While it is possible to safely preserve many kinds of foodstuffs, home canning can expose consumers to botulism and other kinds of food poisoning if done incorrectly. The most common source of food-borne botulism is home-canned foods prepared in an unsafe manner. Safety measures must be taken when performing home canning, since ingestion of toxin in food produced by Clostridium botulinum can cause death. Because of the high risk of illness or death associated with improper canning techniques, the United States Department of Agriculture (USDA) considers it critical that consumers who intend to can at home obtain proper and current information from a reliable source. At the basis of these recommendations is the balance between bringing the food to a high enough temperature for a long enough time that spoilage and disease-producing microorganisms are killed, while not heating the food so much that it loses nutritive value or palatability. In North America, home canning is usually done in Mason jars, which have thicker walls than single-use commercial glass jars. Unless the food being preserved has a high acid content (pH <4.6) or salt or sugar content resulting in water availability <0.85, such as pickles or jellies, the filled jars are also processed under pressure in a canner, a specialized type of pressure cooker. Ordinary pressure cookers are not recommended for canning as their smaller size and the reduced thickness of the cooker wall will not allow for the correct building up and reducing time of pressure, which is factored into the overall processing time and therefore will not destroy all the harmful microorganisms. The goal in using a pressure canner is to achieve a "botulinum cook" of 121 °C for 3 minutes, throughout the entire volume of canned product. Canners often incorporate racks to hold Mason jars, and pressure canners are capable of achieving the elevated temperatures needed to prevent spoilage. The most common configuration is a Mason jar with a flat lid and screw ring. The lid is generally made of plated or painted steel, with an elastomeric washer or gasket bonded to the underside of the rim. The lid also incorporates a slightly dimpled shape, which acts as an indicator of the vacuum (or lack thereof) inside a sealed jar. A newer reusable lid is now available that uses a flat plastic disk with a reusable rubber gasket. The ring threads onto the top of the jar over the lid to hold it in place while the jar cools after processing; the ring can be removed once a vacuum has been established in the jar. Jars are commonly in either pint or quart capacities, with two opening diameters, known as "standard" and "wide mouth". When a jar has cooled and is properly sealed, pressing the dimple on the lid will not make any sound. An improperly sealed jar will allow the dimple to move up and down, sometimes making a popping noise. Lack of this noise does not necessarily indicate that the food in the jar is properly preserved. Typically, during the cooling process, a properly sealed lid will pop once as the pressure inside the jar is reduced enough that atmospheric pressure pushes the lid inward. Older variations had a ceramic seal inside a one-piece zinc lid. Another method that is no longer recommended was the use of layer of hot paraffin wax poured directly over the top of the food (especially jams and jellies) to seal it from air, thus reducing growth of aerobic microorganisms like mold. In the United Kingdom home bottling is done with Kilner jars in a similar way to the Mason jars in the US, and although old-style Kilner jars have a glass lid without a "dimple" more recent varieties do. Most home bottling is done using the "open kettle method", with hot food ladled into hot jars and lids placed on jars, with no water bath sterilization processing of the product afterward. In Australia the most popular home canning system is Fowler's Vacola. This system uses glass jars, single use seals, metal lids, and a water bath canning sterilization process. During the canning process the lids are secured by metal tension clips which are removed once a vacuum seal has formed. Fowler's Vacola products are still produced and are available from some hardware stores. Used equipment is frequently sold on online auction sites and in opportunity shops. In Germany the most popular home canning system is Weck jar. This system uses glass jars (80ml-2.5l) and glass bottles (200ml-1l), reusable rubber seals, glass lids, and a water bath canning sterilization process. During the canning process the lids are secured by steel tension clips which can be removed once a vacuum seal has formed. During storage the vertical position of the rubber seal's external tongue indicates the status of the sealing. Weck products are still produced and are available from German hardware stores. Used equipment is frequently sold on online auction sites and in opportunity shops. They can be used for water bath canning and pressure canning. For water bath canning use two steel tension clips and for pressure canning use three steel tension clips. Remove them after vacuum has formed. ^ Mendelson, C. (2005). Home Comforts: The Art and Science of Keeping House. Scribner. p. 180. ISBN 978-0-7432-7286-5. Retrieved November 2, 2017. ^ The Complete Book of Home Canning. Skyhorse Publishing. 2015. p. 25. ISBN 978-1-63220-886-6. Retrieved November 2, 2017. ^ Centers for Disease Control and Prevention: Botulism in the United States, 1899-1996. Handbook for Epidemiologists, Clinicians, and Laboratory Workers, Atlanta, GA. Centers for Disease Control and Prevention, 1998. ^ , National Botulism Surveillance by CDC. ^ Andress, E, Kuhn, G. (1998). Critical Review of Home Preservation Literature and Current Research. Athens, GA: University of Georgia, Cooperative Extension Service. Reprinted by the National Center for Home Food Preservation. ^ "What is Open Kettle Canning? (with picture)". Wisegeek.com. 2017-09-26. Retrieved 2017-11-02. This page was last edited on 23 January 2019, at 17:58 (UTC).